Day two of giveaways is now live for entries. You will have until 10:30 am 4/26/2014. Be sure to follow all the steps of entry for more chances to win! 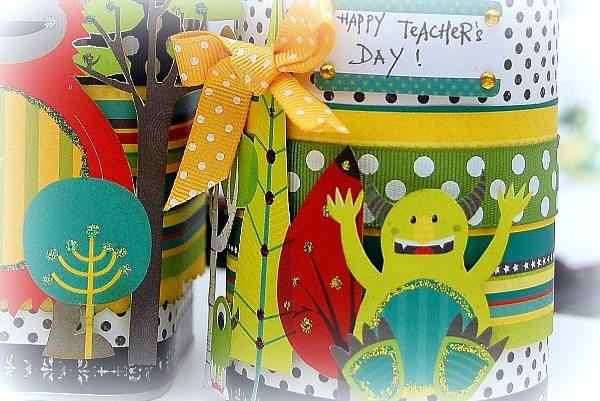 Teacher's Day is fast approaching and it's the perfect time for me to create some gifts using recycled tins and the "Our Lil' Monster" collection. The monsters are so cute and it could easily make any projects looks fun and happy. I really love the bright and cherry colors in this line. This collection is so perfect for anything little boy-related. 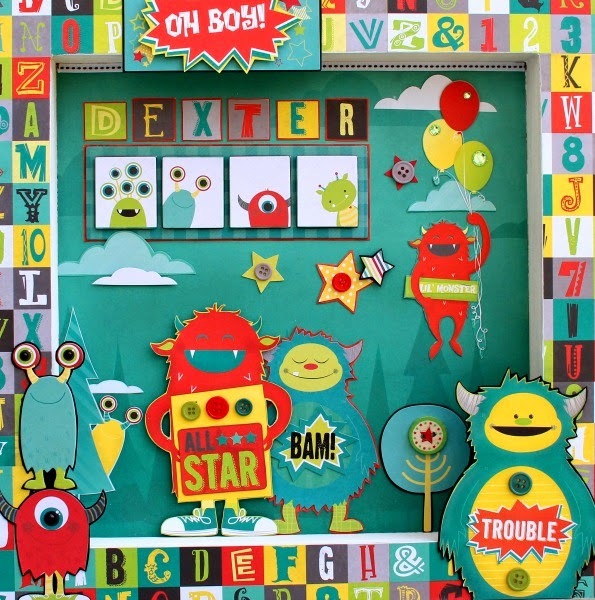 My son Dexter turned 5 not long ago and he loves monsters, so when I showed him this paper collection, he was over the moon. I asked him if he wanted me to make something for his room with the paper, and of course, he did. His only request? That it have "a lot of monsters". He's really into that book, "Where the Wild Things Are" too. I used one of those cheap, unfinished wood frames from Michael's. To begin, I painted all the edges white. Then I used the paper to cover the frame edge, and inside the frame. At that point, I sanded the edges to give it a smoother appearance. And then... well, I just added LOTS of monsters! This came out as a pretty big project - the inside of the frame is 12x12, plus the outside, it makes for very nice-sized home decor. 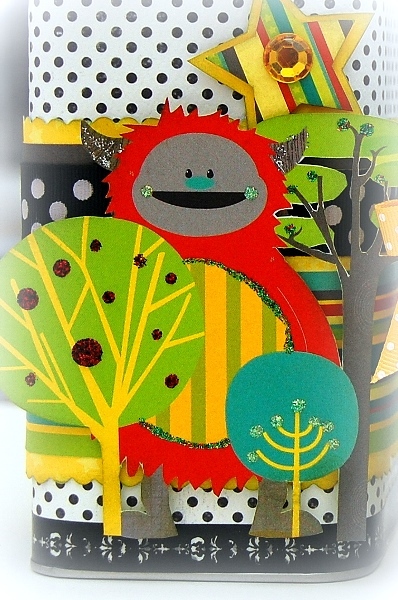 I just loved how bright and cheerful the papers are, and how cute the monsters are. Love this idea for teacher gifts!! Oh Wow amazing Lil MOnster work! I think I need the collection again! and Day two of the contest! This little monster is so cute. One of my favorite parts of the new Enchanted Garden collection is the colors. I love purple. The paper. I am a paper junkie and absolutely adore your papers. The colors in this collection is great for either girl or boy layouts. Great idea for the teacher gifts, especially as we approach the end of another school year! Love the teacher gifts! The parts of the Enchanted Garden I love the best are the colors. I'm a sucker with anything with purple in it!!! Love the projects featured today! In the enchanted garden I can't wait for those Chipboard pieces! Too cute! Love the room décor! Great idea! 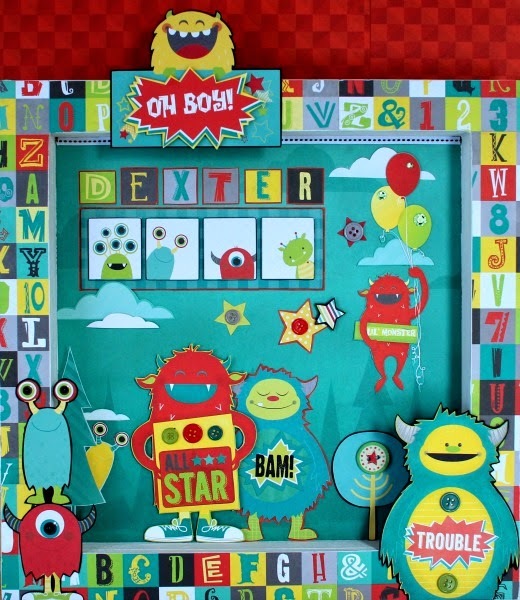 How stinking adorable is that shadow box! I am loving all the ideas all the time. Thank you. oh, forgot to say that my fav product is the pp. Great projects ... Love to win some Bo Bunny products ! The Our Lil' Monster projects are so cute! My favorite product on the Enchanted Garden giveaway would probably be the layered chipboard pieces. Love it all though! I think my favourite are the garden brads. Love your monsters!! Cute projects! Love that collection! Sweet projects. Love the bright colors in this collection. Great monster project. Love the Chipboard pieces. The 6x6 paper pad.....the size is perfect for card making!! I know 2 little boys who would love this. I love the colors, love the paper pad! Beautiful papers. Thanks for chance to win. Beautiful collection. I love the paper pad! My favorite are the enchanted garden ephemera! I love the paper pad but perhaps my most favourite is the pennant flags in the button pack. Fabulous monsters! It makes me smile with each picture. I would really love that 6x6 Enchanted Garden Paper Pack! Ooooh the cards I could create with that! I love the paper, such beautiful colours! Its hard to pick a favorite but I love all the embellishments. They add great finishing touches to my projects! 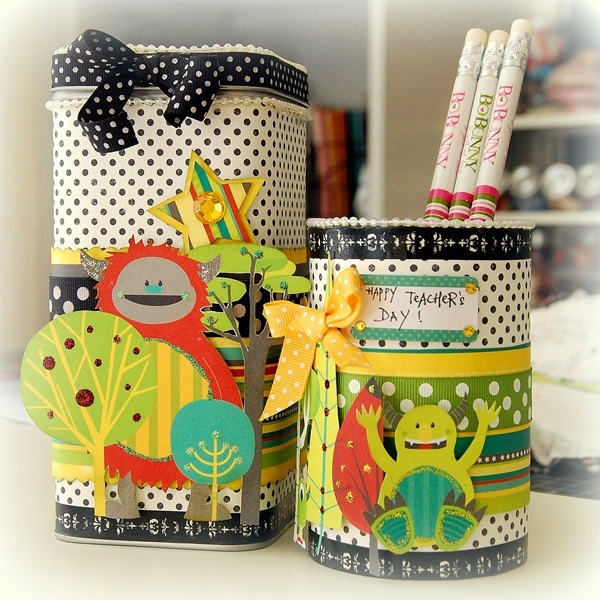 Adorable projects with the monster papers! It would be amazing to win anything enchanted garden! I can't honestly pick a favourite! Those are really cute teacher gifts! Love Bo Bunny!!!! Thanks for a chance to win! Good luck everyone!!! cute projects! i love the paper in the Enchanted Garden! Thanks! 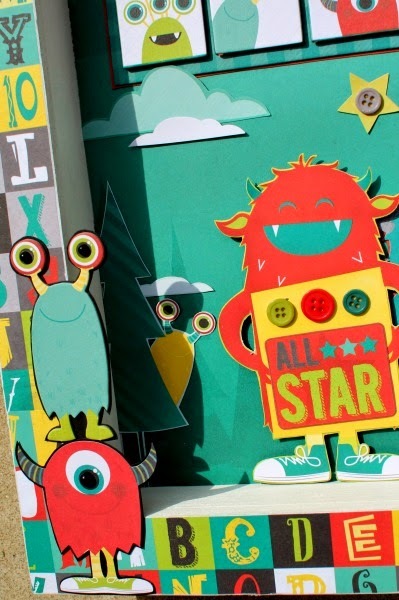 Wow, these Little Monster projects are adorable! Love all the bright colors of the collection. the bling in enchanted garden is my fave. love the black and white with the bright colors for the teacher's gifts. 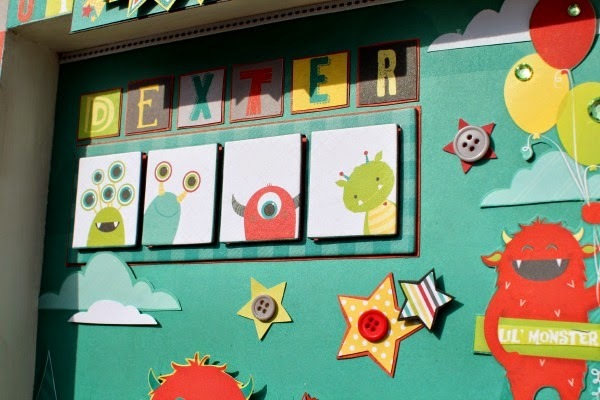 Such Cute Lil Monster projects! Fabulous giveaway my fav is the buttons. The monster collection is so fun! Funny thing, my friend would love the dexter project! I love the colours in this new collection - the papers are gorgeous! I love all of the Enchanted Garden collection...but today I have to say the 6 x 6 paper pad! Love 'em! I love the embellies! Brads are AWESOME! I LOVE!!!!!! The monsters are so cute!!!!! Enchanted Garden is my favorite collection of the tree new ones - I'd love to get my hands on the papers! How fun these different projects the teachers gift ideas for the teachers in the family and the llil' monsters are so cute. great work. I love die-cut pack most of all. So cute. sigh........the more I see of Enchanted, the more I am in love.....Tnx for giving us a chance to win!! What a gorgeous collection. Love those colors. Loving the papers; such beautiful colours and patterns! Love Bo Bunny, Monsters, Enchanted Garden and Lemonade Stand, Oh My. The colors in the Enchanted Garden collection are fabulous! My favorite thing today is the 6X6 paper pad. Love those projects---very cool ideas! Love the colors in Enchanted Garden---so many pretty things about that collection! Thank you for the chance to win, I love the new collection! I really love the brad set for Enchanted Garden! Your pieces are always so beautifully made! 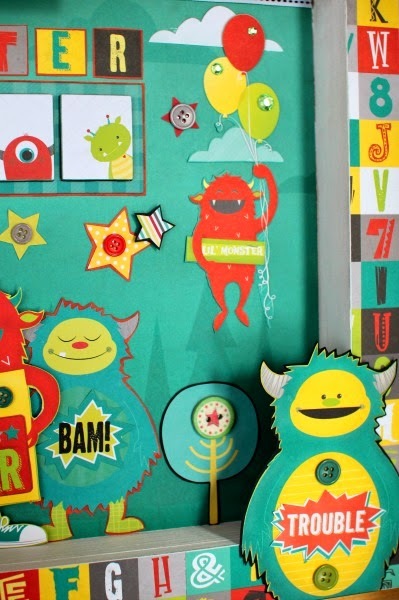 Monster Decor is too cute for words... love those colours! Very cute stuff for kids cards! Very cool monster projects!! Love the Enchanted Garden 6x6 paper pad! Fantastic projects today! I love the brads, buttons and jewels. Super adorable projects and love the opportunity to win! Being a paper-holic, my favorite part is the paper pad! Great projects - love the bright colors !! Thanks for a chance to win !!! Wow, so many really cute projects and awesome giveaway! My favorite in this collection are the pearls and the papers! Enchanted Garden is a gorgeous collection ... the colours make me swoon!!! 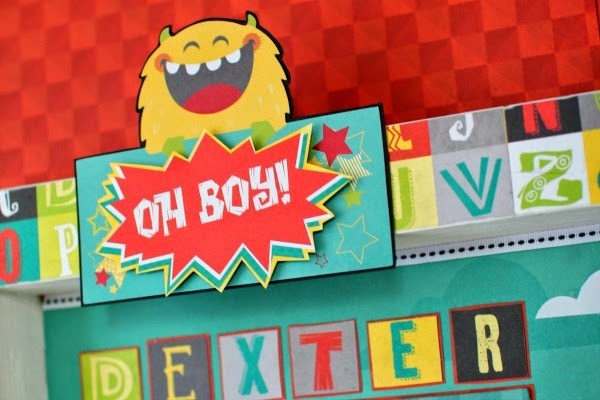 I love the paper pad, too cute for making a mini album and monster bookmark for my son! Enchanted Garden looks so romantic and beautiful. Can't wait to see it in the shops. This collection is so lovely! My favorite item for today's give away is the 6x6 paper pad. I love the condensed patterns! So perfect for card making! A lovely collection. I like the paper and the brads. I love the 6x6 paper pad... perfect for making cards! I like the paper pad! I haven't seen enough of the collection yet to judge but already know that I love the colors! My favorite part of the collection is the colors! I love the paper and the brads! Beautiful! I love the whole collection the colors are amazing. Goodness this is such a fun,happy collection! I am still loving the classroom kit-perfect for me. super cute!! love the colors!!! the colors!!! and the patterns too!! FUN & FABULOUS projects Irene and Ilene!!! THANK YOU for the chance to win these CRAFTY PRETTIES!!! The brad pack or buttons caught my eye. Really love all the colours. Thanks. Bo Bunny, you are amazing. Love the Enchanted Garden fairies. These all are just the cutest!!!! Totally loving this line with the bright happy colors! Really want to get my hands on that Enchanted Garden 6x6 pad, thanks for the chance. I love the buttons & brads! Both very versatile & great for including in clusters. I am so loving the lil monsters LOL they are just too cute...as for the enchanted garden I would say the brads! I am so in to Yellow right now it would be awesome to win this collection. thanks for the chance to win. What a great project and the collection is just fab!